At the age of 89, Mrs. Ngu in Dai Quan village, Khoai Chau district in northern Hung Yen province, still has bright eyes, her health, and strong and shiny black teeth. She always wears a black scarf on her head, keeps her money in a “ruot ngua” (horse’s gut) bag, made from a piece of long cloth with a long string to tie around the waist, has betel nut by her side, and is known by her husband’s name. Her great-grandchildren’s generation may be surprised to find she doesn’t use a toothbrush, instead preferring dried areca. They may feel impatient waiting for her in the morning, as she spends at least 15 minutes brushing her hair, then rolls it into a bun on the top of her head, secured with a black velvet strip, and finally, skillfully covers her head with the black scarf. They may also discover there is always a thin lay of reddish-brown “paint” covering her 89-year-old lips. 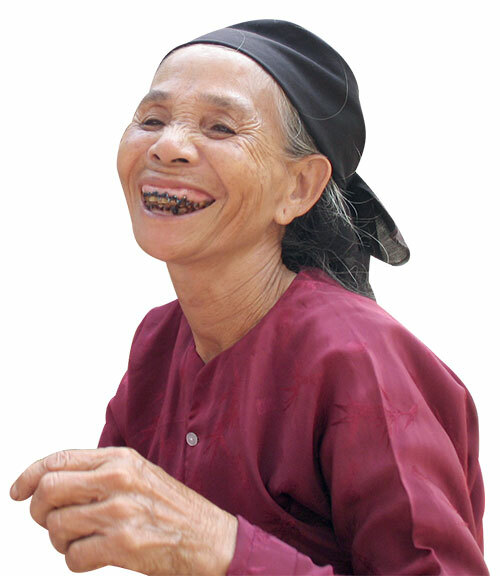 Women with black teeth, chewing areca nut with betel leaves, and being called by the name of their husband are old Vietnamese customs dating back centuries. According to folk researcher Phan Ke Binh, the word “phong tuc” (custom) is used for good habits, while “hu tuc” is for bad habits. Such habits have been formed over the centuries and passed down from generation to generation. Important elements in Vietnam’s national culture, customs differ from place to place due to diverse practices of obligation as well as environment and occupation, but all originate from the time Vietnam was an agrarian country and the vast majority of people were farmers. media - The Guide is pleased to introduce a number of ancient yet interesting customs formed hundreds of years ago. Along with historical developments and the “invasion” of Western culture, such customs have been eroded over time and some are in danger of disappearing. For Vietnamese, the hair and the teeth are considered the two most important physical features. There is even an idiom, “cai rang cai toc la goc con nguoi” (roughly translated as “the hair and teeth are the important parts of our body”). People in olden days believed that just by looking at the way one cares about his or her hair and teeth can we know about their personality. At that time, babies’ heads were shaved until they were three or four years old. 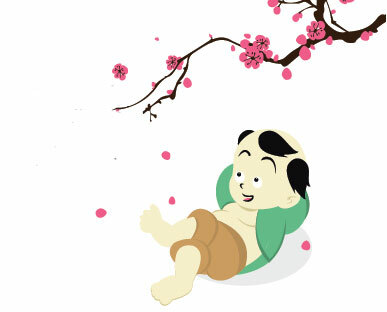 Male babies retained a tuft on the top (called “chom” or “hong mao”), while girls were allowed one on the nape of their neck (“cun cut”) or sometimes on each side of the head (“trai dao”, meaning two peaches). Hair was usually allowed to grow from the age of 12 or 13 for both boys and girls. Men tied their long hair into a bun on the nape of the neck, while women usually rolled theirs into a turban shape but left a small lock sticking out (“duoi ga” or rooster’s tail). Women in the southern and the central regions, though, wore a style much like that of men in the north. Such styles were considered essential to beauty, so people who could not grow their hair long usually wore a wig. The only exceptions were Buddhist monks and beggars, who always shaved their heads. Nowadays, Vietnamese people, especially the young, have caught on to hairdressing trends from around the world, and few boys have a tuft of hair on a shaven head. In days long gone, as soon as a child’s adult teeth came through, they were coated in black to protect them against decay and make them stronger. Glossy black teeth were also seen as an essential attribute of female beauty. Lemon juice and shellac (nhua canh kien) were ground into a paste on a leaf and spread over the teeth before bedtime. The initial layer lasted a week, and in order not to waste it, women had to learn how to eat their food without chewing (or choking!). After the first week, a mixture of alum and shellac was then applied. To fix this mixture permanently, the teeth were coated with a gum made from pounded coconut. When this set, women could chew to their heart’s content. While a woman could renew the dye every year until she turned 30 to preserve her beauty, men would go through the process only once or twice in their lifetime. Young women of today, though, prefer white teeth, and they tend to use chemical brightening toothpaste that keep their teeth dazzlingly bright. Since time immemorial, Vietnamese of both sexes have chewed areca and betel. According to ancient researchers, the custom may have first appeared under the regime of the third Hung King, in the first millennium BC. A piece of betel leaf dabbed with lime was then rolled. When chewing, people take a roll to eat accompanied with a piece of areca nut and a sliver of bark. The taste is acrid though pleasurable, and the combination is a mild stimulant. The fresh sweetness of the areca, the buttery taste of the bark, and the heat from the lime provide a bitter-sweet flavor. The juice of the chewed betel raises the spirits. It gives the saliva a brick-red color and temporarily dyes the mouth, lips and gums orange brown. Ancient Vietnamese may have stained their teeth dark brown simply by chewing on areca and betel. 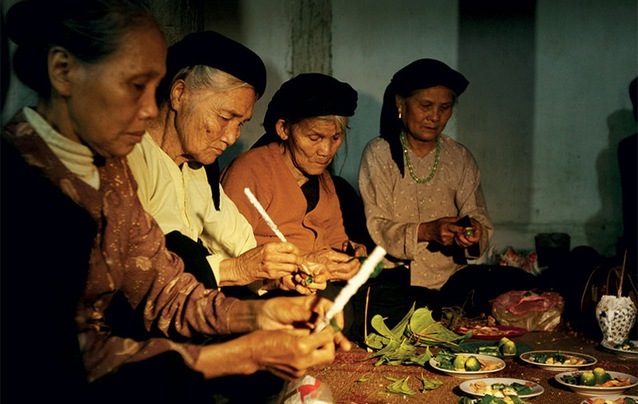 In the Vietnamese tradition, betel symbolizes love, marriage, cults, and social interaction. Traditionally, areca and betel were indispensable parts of ceremonies and festivals. People placed bunches of areca nuts and a pile of betel leaves on their family altars. In the early days, they rolled betel only when making an offering to the ancestors, but today betel still can still be found at Vietnamese weddings and funerals. An old story has it that, a very long time ago, a merchant named Au Minh passed Thanh Thao Lake one day and was presented with a maid called Nhu Nguyet by the Lake Lord. Au Minh took the maid home and then became very rich several years later. One day, on the first day of Tet, he beat Nhu Nguyet. In fear, she buried herself in the rubbish and disappeared. With his maid gone, Au Minh then became poor again, and the custom of not throwing away rubbish in the first three days of Tet took hold. Other taboos during Tet include avoiding lending money, as anyone who lends money at this time will be broke for the rest of the year, not starting a new business at the beginning of the year, as this is unlucky and the business will not succeed, and not cursing and swearing in the early days of Tet, which brings bad luck for the rest of the year.